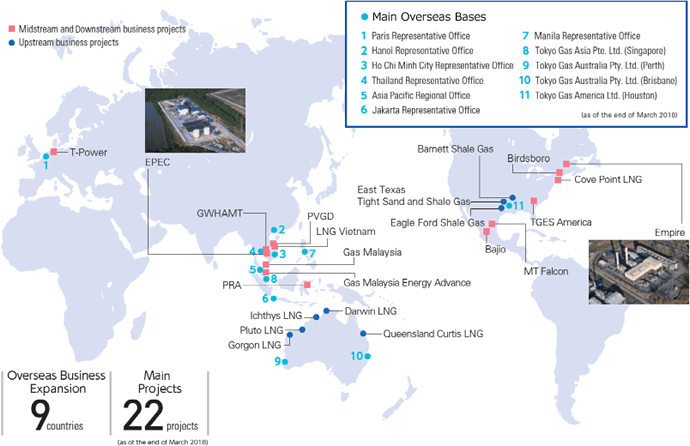 In order to source natural gas to meet demand flexibly and competitively, we work with diverse players in Japan and abroad while diversifying our procurement sources, contract conditions, LNG networks and other factors. The Tokyo Gas Group owns and operates its own fleet of LNG carriers, allowing LNG to be shipped swiftly and flexibly. By receiving LNG and constantly producing city gas, the Group contributes to energy security in the Tokyo metropolitan area. Our four LNG terminals at Negishi, Sodegaura, Ohgishima and Hitachi function as mutual backups for each another, ensuring uninterrupted city gas supplies even in the event of a power failure or other incidents. Our pipeline network is shared with gas retailers. We are further developing our pipeline network and using LNG tanker trucks and coastal tankers to ensure the safe and uninterrupted delivery of city gas. In addition, we are expanding our wholesale distribution of gas to other gas suppliers. We operate high-efficiency combined cycle natural gas-fired power stations utilizing our LNG procurement capabilities and LNG terminals, pipelines and other facilities. In addition, we generate electricity using wind power and other renewable energy resources. Kawasaki Natural Gas Power Generation Co., Ltd.
Tokyo Gas Yokosuka Power Co., Ltd.
Tokyo Gas Baypower Co., Ltd.
Power is transmitted via a grid operated by general power transmission utilities. We develop energy solutions by combining distributed energy systems such as fuel cells and combined heat and power (CHP) systems* that reduce CO2 emissions, energy consumption and peak load, with the wider use of environmentally friendly gas appliances and renewable sources of energy. Alongside selling energy in the form of gas and electricity, we offer new value and services that enrich the lives of customers. Data for long-term contracts and for LNG carriers owned and operated by Tokyo Gas are as of the end of May 2018. Data on LNG procurement volume is the actual result for fiscal 2017. All other data are as of the end of March 2018. 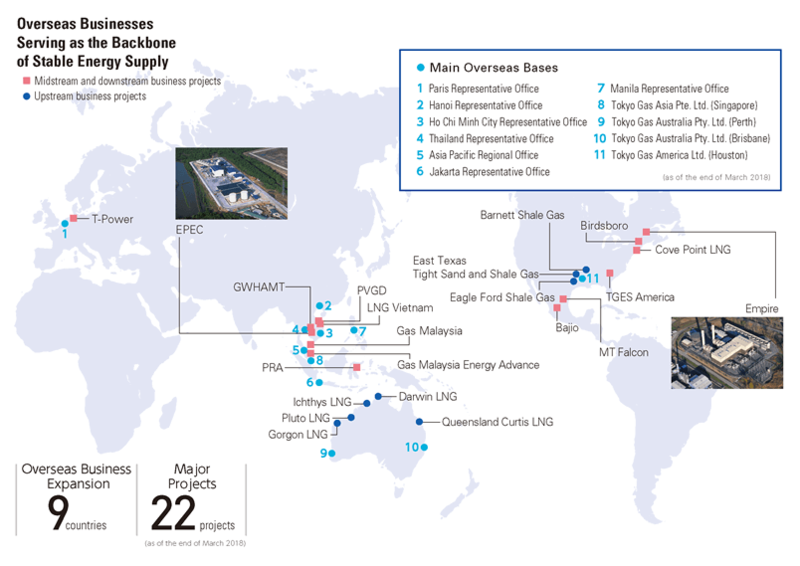 In addition to sourcing gas from large-scale LNG projects and acquiring participating interests, we are diversifying and expanding our sources and upstream projects overseas through involvement in unconventional gas such as shale gas, and in small- and medium-scale LNG projects. We also leverage the Group’s technologies and expertise in the total energy business to develop energy infrastructure and energy solutions for customers expanding their overseas operations, particularly in Southeast Asia and North America. By extending our LNG value chains overseas, we seek to contribute to both the flexible procurement of LNG for Japan and stable supplies of energy in the countries where we operate. Data are as of the end of March 2018.